We’ve had such beautiful weather lately! After this past cold, snowy winter, I’m savoring these amazing sunshine-y, 70-degree days. The warmer weather has had me itching to dust off the grill, and we finally had a chance to break it out last week. We made this grilled honey lime chicken, which is always a hit, but instead of making the cilantro lime rice that I normally pair with it, I decided to tweak this lemony basil orzo pasta salad and turn it into a bright, fresh Greek orzo pasta salad. 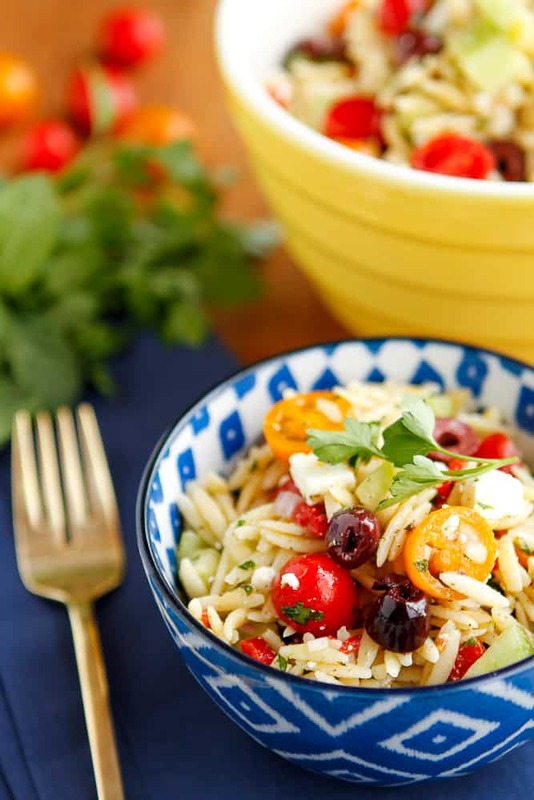 As I’ve shared before, my secret for a truly delicious orzo pasta salad is in tossing the cooked orzo with the dressing while the pasta is still hot. I kept the lovely citrusy lemon dressing, roasted red peppers and grape tomatoes from the original, and then I added in cucumber, shallots, feta cheese and a hint of fresh mint. Oh, and I also tossed in a heaping handful of halved Kalamata olives! Now, I happen to adore olives of all kinds, but I know that they’re not for everyone, including several members of my family. By halving the Kalamata olives, you leave the pieces large enough to be easily picked out by the olive adverse. These new Pearls Olives to Go! single serving, liquid-free cups of olives are a fabulous alternative to the larger jarred olives for households divided on this ingredient. I pick them up at Walmart and keep them in the pantry to sprinkle over my salads, pizza, etc., keeping my non-olive eating family members appeased. Also, I love them for a quick snack. 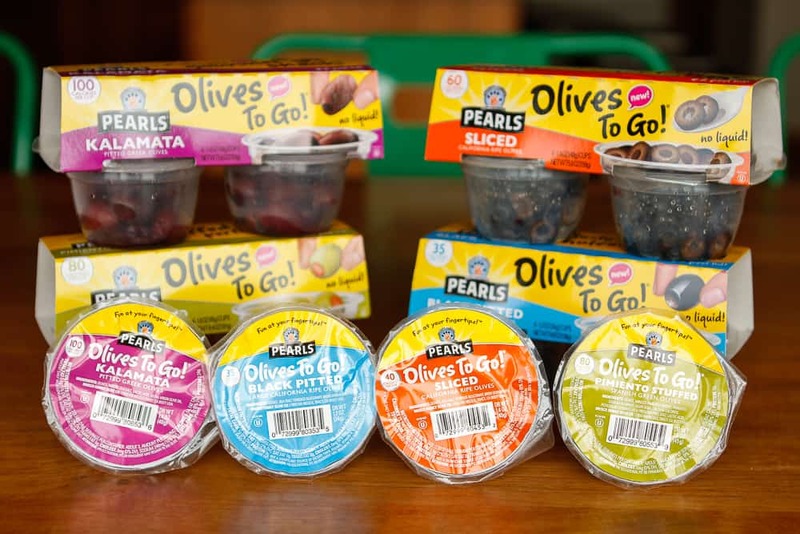 Since Pearls Olives to Go! have no liquid, there’s no mess! My fave are the pimiento-stuffed green olives, but the Kalamata olives are a very close second. Ranging from only 35-100 calories per serving cup, they’re a satisfying, travel-friendly snack option packed with flavor. 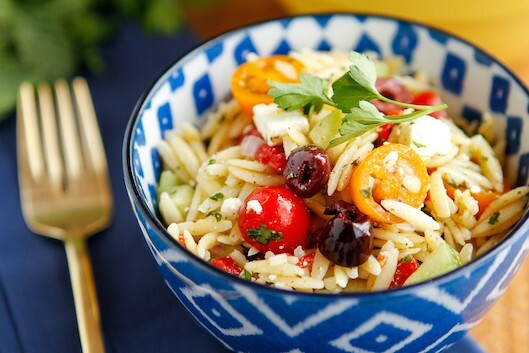 Personally, I think this Greek orzo pasta salad wouldn’t be the same without the generous addition of dark, fruity, flavorful Kalamata olives, so even if you’re on the fence about olives, please try it with them first! While the orzo is cooking, zest and juice the lemons into a large mixing bowl, and whisk in the olive oil, dill, oregano, and pepper. Allow the dressed pasta mixture to cool while you chop the rest of the ingredients. Fold in the red peppers, grape tomatoes, olives, cucumber, shallots, parsley and mint. P.S. This orzo pasta salad recipe makes a BIG potluck-style batch, which is perfect for the upcoming cookout and potluck season, but if you have a smaller family, you may want to consider halving the recipe. But then again, maybe not — because it’s totally delicious and perfect as a make ahead lunch!